Incomplete architectural sculpture, centre detail. 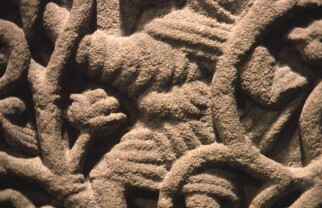 This fragment is a plant-scroll inhabited by men and a beast. In the centre there is a male figure, whose left arm is outstretched and his right arm is raised. He is shown in profile, wearing a short kirtle, and appears to be bare-footed, striding over the branches.